ETH doctoral student Kai von Petersdorff-Campen has developed a method to create products containing magnets using 3-D printing. He used an artificial heart pump to demonstrate the operating principle – and won an international prototype competition. When Kai von Petersdorff-Campen decided to make an artificial heart pump using 3-D printing, he did not suspect that his project would attract so much attention. 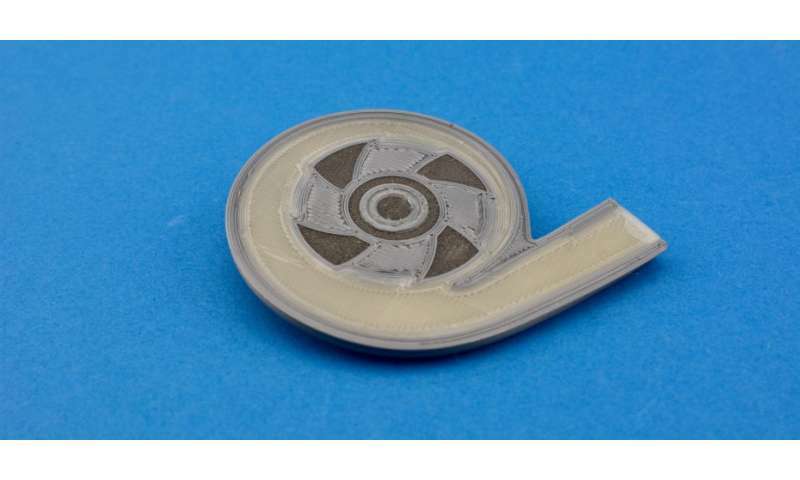 The piece of plastic that he took from the printer after 15 hours was of very low quality. But as the ensuing test showed, it worked – and that was the key point. "My goal was not to make a good heart pump, but to demonstrate the principle of how it can be produced in a single step," says Petersdorff-Campen. The 26-year-old doctoral student in the Department of Mechanical and Process Engineering developed the prototypes this spring within just a few months. He then received an invitation to the prestigious ASAIO conference in Washington in June, where he gave a podium speech. He also won the prototype competition with the video he submitted about the project. The significant part of Petersdorff-Campen's project is not the heart pump itself; this is simply an example application of the 3-D printing method that the young ETH researcher has developed. Artificial heart pumps are not only geometrically complex products, but, more importantly, they contain magnets – and in the field of 3-D printing with magnets, research is still in its infancy. Petersdorff-Campen's heart pump is therefore one of the first prototypes with magnetic components manufactured using 3-D printing. Petersdorff-Campen calls his newly developed method "embedded magnet printing". The key is to ensure that the magnets are printed directly in the plastic. 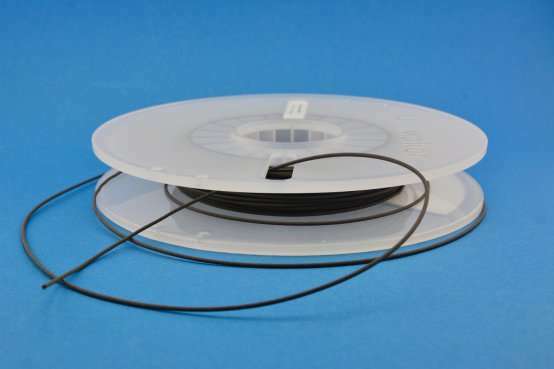 Magnetic powder and plastic are mixed before printing and processed into strands known as filaments. These then go through the 3-D printer, where they are processed in a similar way to conventional 3-D printing – Petersdorff-Campen chose the FDM method. A nozzle automatically outputs the computer-generated form, with its various components. Finally, the printed piece is magnetised in an external field. One of the biggest difficulties was developing the filaments: the more magnetic powder that is added to the granulate mix, the stronger the magnet, but the more brittle the end product. However, in order for the filaments to be pressed through the 3-D printer, they must be reasonably flexible. Petersdorff-Campen has now succeeded in finding a happy medium. "We tested various plastics and mixes, until the filaments were flexible enough for printing but still had enough magnetic force," he says. Petersdorff-Campen, who works in the Product Development Group at the Institute for Design, Materials and Fabrication under Professor Mirko Meboldt, not only presented the method at the research conference in Washington, but has also published it in an academic journal. The reactions varied, he explains: "Some people are already asking where they can order the material." Others criticised that the 3-D printing is not suitable for the production of medical devices, due to the various approval processes. "That was not my focus, however," emphasises Petersdorff-Campen. "I simply wanted to show the principle." He is sure that it is worth further development by scientists and developers. Even though the method may not be suitable for heart pumps, the potential of 3-D printing of magnets is huge: they are a key component in much more than just medical devices. For example, they are used in electric motors, such as those in numerous technical household devices, from a computer's hard drive to loudspeakers and microwaves. Today, geometrically complex components with magnets are produced by complex injection moulding: 3-D printing could make this process significantly quicker and therefore cheaper. However, that is still a long way off, says Petersdorff-Campen: "There is still a lot to improve in terms of material and processing." For example, his heart pump may have passed the initial tests and pumped 2.5 litres per minute with 1,000 rotations, but this does not yet meet the standards required in practice: "I wouldn't want to have such a device implanted."